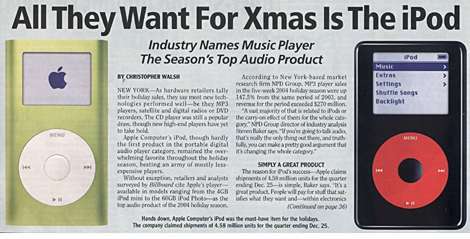 According to Billboard (Jan 29, 2005), Apple's iPod remained the overwhelming favorite throughout the holiday season, besting an army of mostly less expensive players. Without exception, retailers and analysts surveyed by Billboard cite Apple's player - available in models ranging from the 4GB iPod mini to the 60GB iPod Photo - as the top audio product of the 2004 holiday season. According to New York-based market research firm NPD Group, MP3 player sales in the five-week 2004 holiday season were up 147.5 per cent from the same period of 2003, and revenue for the period exceeded US$270 million. The reason for iPod's success - Apple claims shipments of 4.58 million units for the quarter ending Dec 25 - is simple, NPD Group director of industry analysis Steven Baker says. "It's a great product. People will pay for stuff that satisfies what they want and - within electronics especially - does it in an elegant and usable manner. The [iPod] mini is a tremendous product." * We found this graphic floating on the net and felt it fitted the piece. Thanks to the folk/s who created it.